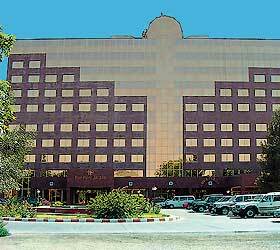 "Ak Altin Hotel" is located just several minutes away from Ahgabad city centre, among major sightseeing spots and administrative buildings. The proximity to a convenient traffic interchange allows easy access to the airport and the railway station. Ak Altin Hotel offers accommodation in 119 comfortable rooms of various categories. The rooms include all the amenities required by a modern traveller - individually controlled air conditioning, satellite TV, mini bar, telephone, hair-dryer, fridge, en-suite bathroom with bathtub and/or shower cubicle. Some rooms are also complete with bathrobes and slippers. Moreover, the hotel provides possibilities to arrange conferences, seminars and presentations, offering several conference rooms of varied capacity. The hotel's business centre allows guests to carry out heir business activities, even while travelling. In addition, Ak Altin Hotel provides an array of supplementary services and facilities, among which there are - laundry and dry-cleaning service, secured parking, swimming pool, tennis court, sauna, gym, health centre, entertainment complex, gifts shop, porter service, wake-up calls, and many more.